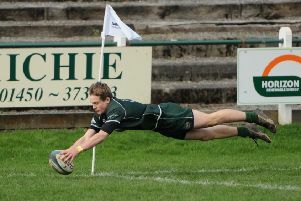 Ryan Pritchard, number five, scores for Selkirk Victoria against Hawick Legion Rovers. 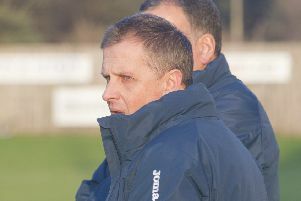 He and other committee colleagues are focused on creating a community football squad for Selkirk (picture by Bill McBurnie). Amateur and junior football devotees in Selkirk have kicked off plans to form a community football team in the town. The enthusiasts believe there is the ability and the desire to have football at that level – hopefully at Yarrow Park – and preserve the sport’s image in their town. Selkirk Juniors and their amateur counterparts, Selkirk Victoria, hope to retain their separate identities but are united in their wish to have a community squad. Ultimately, they hope to be able to use the facilities at Ettrickhaugh Road, if appropriate arrangements can be made. It’s understood there would also have to be a lease agreement with Scottish Borders Council for any group wishing access to the changing facilities and the pitches at Yarrow. At present, the process is continuing to wind up the former senior Selkirk FC, which dropped out of the Lowland League earlier this season and effectively disbanded under a welter of debt and a mass exodus of players. Last month, it failed in a bid to retain its licence with the Scottish FootballAssociation. At present, the Juniors and the Vics have an agreement with Selkirk’s rugby and cricket clubs to ‘borrow’ their changing facilities – for which they are extremely grateful. The footballers are involved in discussions about how they may be able to access the Yarrow facilities in future. But, for the moment, the desire and belief in creating a community club is very strong. Ryan Pritchard, Vics’ club secretary, said the juniors had around 100 registered players, while the amateurs were attracting a good following and relatively healthy crowds. This had prompted the wish to start a community club – which would go ahead regardless of whether they gained use of the Yarrow changing facilities. Club representatives met last Friday with local councillor Gordon Edgar, who said he was keen to help as much as he could. Scottish Borders Council was aware of the clubs’ hopes, he added. “The intricacies of the previous occupants have to be sorted out first but, once that is sorted, I am sure there is a way forward.